MSSA's 1st Capricorn Regional Championships hosted by HTS Tom Naudé in Polokwane on 30 September 2017 saw some interesting results. The winners of the CounterStrike: GO esports title, Limro's A (of Fragcon), demolished all of their opponents to take a flawless victory. The previously unranked team, consisting of Tiaan Viljoen, Ruan Kruger, Zedrigh Olivier, Javier Pena Varona, and Keanu Santoyo, thus won the championships rather comfortably and in the process became the first team to ever be awarded Capricorn Regional Colours for esports. Such too was Limbro's A's standard of play, that as a result of their flawless victory, the team moved from being unranked to being ranked 23rd in the country. A MSSA provincial championship in full swing. All clubs that are fully-paid-up and affiliated to Mind Sports South Africa (MSSA) have the opportunity to host official provincial and national championships. The closing date for such bids is 1 November 2017, and must be directed to mindsportssa@iafrica.com. The ability for clubs to host is part of MSSA's policy of developing and strengthening member clubs. By hosting events, member clubs are able to gain much needed publicity and ensure that their members are afforded the opportunity of participating in MSSA provincial and national LAN championships. Any club within a province may bid to host a provincial LAN championship, whereas any club may bid to host a national LAN championships. The rules for the hosting of National and Provincial events is covered by the regulations. a. Members within such province may offer to host, through a bid, any such championship. h. The member may host such championship if at least three (3) clubs submit their entries together with such bid. At the moment there are only two properly constituted continental confederations. The two such confederations are the Asian E-Sports Federation (AESF) and the Confederation of African Esports (CAES). Although AESF is by far the largest confederation in both number of states affiliated and number of gamers registered, both are equally important in terms of the work done. The confederations have a vital role in terms of promoting the growth of esports in all countries and regulating important events like continental championships. The continental confederations are also vital in representing the interests of their members with IeSF, government and the like. 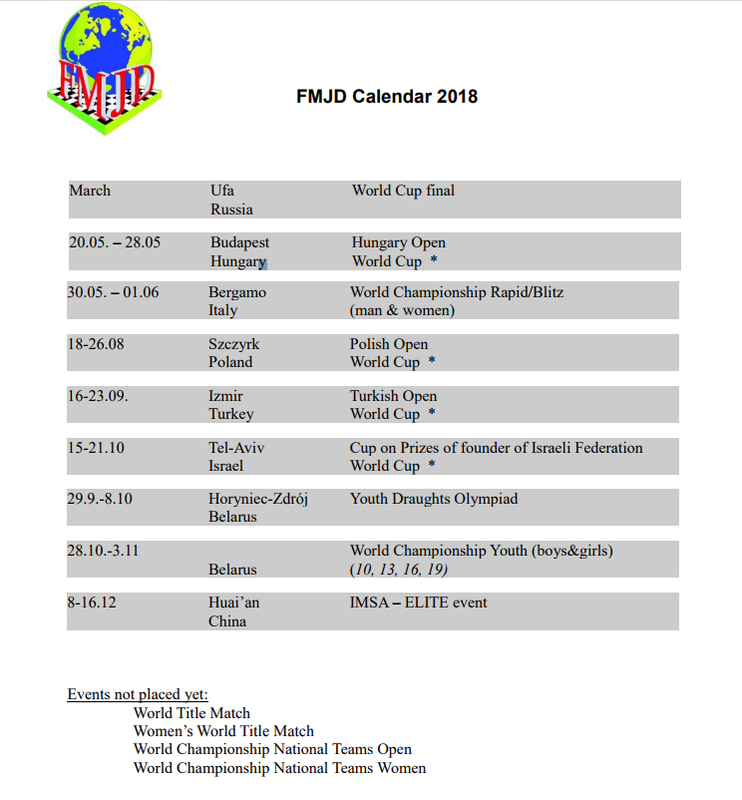 World Draughts Federation announces its Calendar for 2018. The Fédération Mondiale du Jeu de Dames (FMJD, World Draughts Federation) is the international body uniting national draughts federations. It was founded in 1947 by four Federations: France, the Netherlands, Belgium and Switzerland. Currently, the FMJD has more than 50 national federation members. Recently the FMJD has become a member of the GAISF and strives for Olympic recognition. The FMJD memberships is part of a more general movement toward integration of Mind Sports in the regular sports arena, a development that, in the vision of the FMJD, is to be lauded. The Calendar on the left only deals with the world championships for draughts, being the 10 x 10 variant. Mind Sports South Africa (MSSA) offers draughts at all of its Provincial and National Championships.